Below are some testimonials from our happy veterinarians and technician customers. Thank you! "Hey Penny! I LOVE THE KITTY KUDDLY!! Fantastic idea. We had a fearful cat today that needed subq's and cerenia. After putting the kitty in it and kinda folding the sides up and snuggling her against me it worked like a charm... and no one was injured! 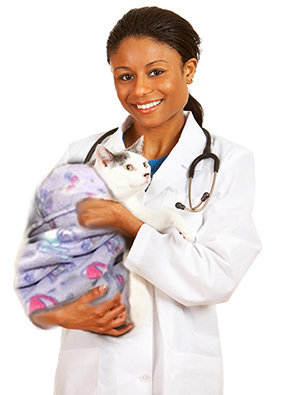 I loved it, stand by it and want whats best for kitties." We have started to use the Kitty Kuddlies in the exam rooms, treatment room and in the ward cages. They are very attractive and we like them very much." The vets and staff are using the Kitty Kuddlies on the kitties and showing to clients and the Kuddlies are working very well." We received the Kuddlies today and used one already. Everyone is excited about them. We got our Cat Friendly Practice Certification today. 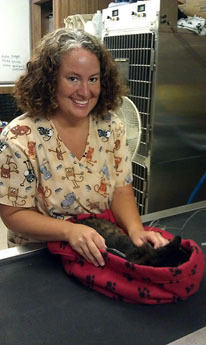 Missy, vet tech at Daniel Island Animal Hospital using the Kitty Kuddly on "Max" Garner. Picture submitted by "Max's" owner Chris Garner. 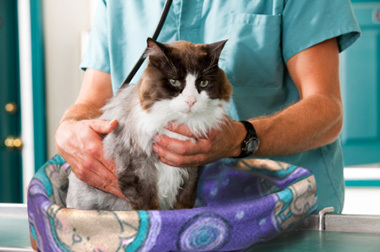 Daniel Island Animal Hospital of Charleston, SC uses the Kitty Kuddly on every kitty patient. Our technician cat enthusiast purchased several Kitty Kuddlies for our practice. 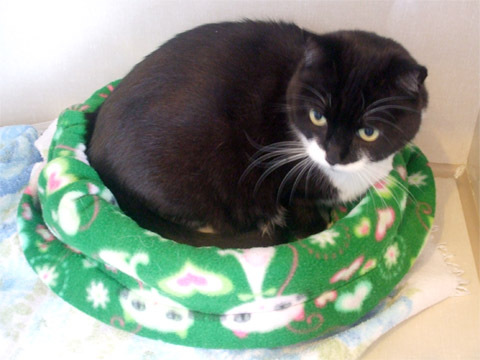 These are great basket-shaped fleece blankets that you can use to cart cats around. They work great during blood draws and exams. I also like them for hospitalized patients that have to go in and out of their cage several times a day. They don't protest nearly as much in their bag as they do naked. The goal is to have clients buy them and bring them in so it smells like home. 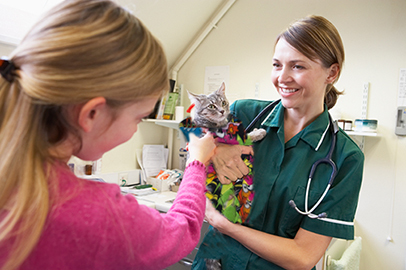 I love your Kitty Kuddly concept, the vets and techs here do too. The Kitty Kuddly idea is growing....We use them on every kitty that comes into the hospital and the clients LOVE them! 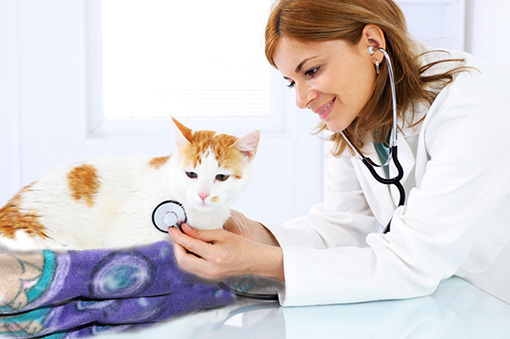 One of our doctors absolutely loves the Kitty Kuddly and uses it for any kind of treatment." Spider getting ready for his exam by Dr Hamilton. "He is very relaxed in his Kitty Kuddly, which makes the exam go smoothly." "I love having the Kuddlies in the hospital; they are SO great for the majority of the cats that come in. 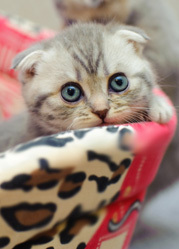 Lots of cats come in quite fearful, and having the comfortable Kuddly around them does seem to calm them down. It also makes treatment much easier. It's also nice when clients bring them in, as it's easy to lift the kitty wrapped in his Kuddly straight from the carrier to the treatment table. 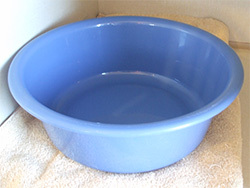 I also bought a Kuddly for one of my cats; I have a small bed and the Kuddly works great as a cover! Now all I have to do is wash the cuddly. My cat never really liked the bed before the Kuddly was on it, but now he loves sleeping in it. Thanks for making such an awesome product!" We have just recently received the Kitty Kuddlies. I have only been able to use them on a few cats in the short time we have had them, but have found I too like the Kitty Kuddly. The thing that I have found very helpful about the Kuddlies is that it makes it very easy to restrain the front end of a cat by wrapping the Kuddly up behind his neck. Much easier to wrap the kitty up in the Kuddly rather than a towel. I find it useful to wrap the kitty in it leaving the head out for a jugular blood sample. Using the Kitty Kuddly for any kind of treatment is much more secure than a towel wrap. The first time I used a Kuddly on a cat in the exam room the client actually wanted to buy one, so I sold it to her." The cats love to snuggle up in them in their cages. Here's a picture of our hospital cat 'PAM' in one of your lovely Kitty Kuddlies... we use them here on every cat as well in the exam rooms and it really seems to calm them down!! Thanks! :)"
"Keeping the animal calm is one of the most important things when giving an exam. Kitty Kuddlies have the magical touch." "We are so excited our hospital sold our first Kitty Kuddly. 'Lucky' the cat with terrible renal disease was cuddled in one for his appointment and IV fluids and we told Mike his owner that he could use the Kuddly to bundle him in and out of the carrier when he came to the hospital for treatments. 'Lucky' looked so cozy all wrapped up in it in his carrier, especially as it is cold and rainy today here in Massachusetts-very gloomy... 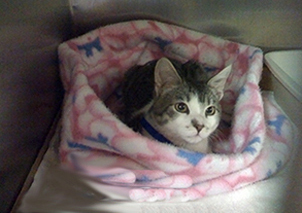 It made all of our staff feel better to have him wrapped up and snuggled into his Kitty Kuddly. Mike and 'Lucky' love the Kitty Kuddly. Thanks for making such a wonderful product for veterinarians, techs, pets and their owners! Sincerely,"